Jason, Bob and I were the only 5 a.m. nutjobs to straggle into the gym this morning. Back at the flower shop, we would’ve been jockeying for space, but today, the box seemed cavernous – especially in the pre-dawn darkness. 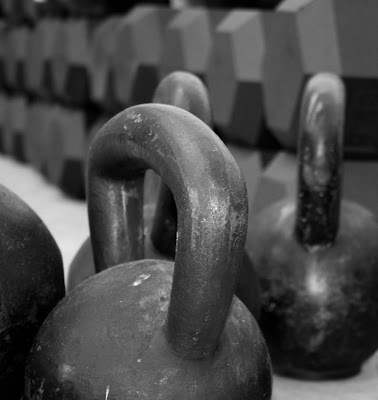 I can’t tell you how much I wanted to do the kettlebell swings with the RXed weight. But 70 pounds is fully half my bodyweight. After a quickly-aborted warm up with the 70-pound kettlebell (I struggled to heave it up over my head even once), I sighed in defeat and picked up the 53-pounder. I made it through the first three dozen reps of overhead swings unbroken, but then had to chunk out the rest. Still, in retrospect, I could (and should) have gone with the new 62-pound KB. It would have been murder, but then again, it’s Friday – I have two days to recover. And I would’ve been closer to my goal of one day heaving the 70-pounder in a WOD. The thruster set at the end of the WOD was too short. By the time I picked myself off the floor, stumbled over to the bar and cleaned it up to my shoulders, there was less than 50 seconds left on the clock. And just as I started to get in the groove, time ran out. Result: 77 swings + 53 pull-ups + 55 push-ups + 35 sit-ups + 18 thrusters = 238 total reps.
Our 5 a.m. class has long served as the guinea pigs for the other M/W/F classes at our box. (Ah, the slings and arrows of outrageous fortune...) After collecting our feedback, Tim made a slight adjustment to the workout, swapping the order of the pull-ups and thrusters. So if you’re working out at CrossFit Palo Alto today and prefer thrusters to push-ups, I’ll gladly take credit for the change. But if you’re a push-up monster and wish I’d kept my big mouth shut, feel free to blame Tim.